At Prosthetic Dentistry of Washington D.C., we take great pride in working closely with our patients to find ideal solutions for optimal oral health and world-class smiles. We understand that your dental problems may require comprehensive treatment, which is why we offer a wide range of restorative and cosmetic dental services. To learn how Dr. Marlin and the staff at Prosthetic Dentistry of Washington D.C. can help you, call us today at 202-244-2101. We serve men and women from across the country, including Washington D.C., Bethesda, Arlington and other areas in Maryland and Virginia. Whether you suffer from discomfort, aesthetic imperfections or a severe dental problem, your treatment must be effective, long-lasting and in your best interest. At Prosthetic Dentistry of Washington D.C., we are proud to be your problem-solvers. “Dr. Marlin is The Best! I was in pain and unable to chew on the left side of my mouth for 5 years… Multiple doctors told me I was just going to have to learn to live with the pain. I was referred to Dr. Marlin when issues arose fitting crowns to the four teeth with root canals and while trying to live with the pain. Dr. Marlin had consults with me and my husband. He listened to me. I can now chew anything and everything. I never thought I would eat nuts, pretzels, or anything hard again. Dr. Marlin changed my life. I am no longer mentally consumed with my pain. In addition, his office staff is amazing. Everyone is friendly and helpful. Dr. Marlin is pleasant and thorough. He will work with you always with your best interests in mind. I have zero reservations recommending Dr. Marlin to others.” – Barbara H (see our “Five Star Reviews” for the full testimonial). We take a comprehensive approach to dental evaluations and treatment recommendations. We continually solve the most complex dental problems for both our long-term patients and those who have been referred to us from different practices. 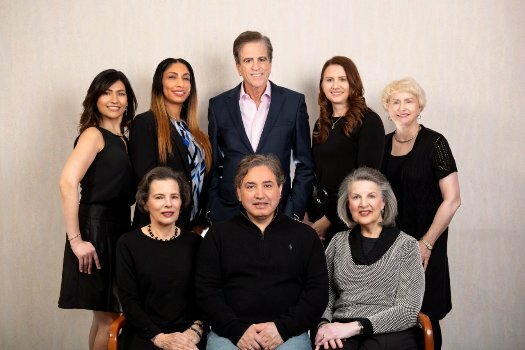 Dr. Gerald Marlin and the staff at Prosthetic Dentistry of Washington D.C.
Clear, honest communication is an essential component of successful treatment. Because of this crucial element of trust, Dr. Marlin and the staff at Prosthetic Dentistry of Washington D.C. take patient relationships very seriously. We firmly believe that exceptional dental care is built on a foundation of experience, skill, compassion and integrity. We never take a one-size-fits-all approach to patient care. Instead, we take time to get to know you, your goals and your unique oral state. We are accustomed to treating the most challenging dental cases. This requires us to always apply a fully comprehensive approach to dental care in our office. The process starts with listening to your concerns, collecting data and designing a customized treatment plan and appropriate alternatives. We “quarterback” your care, bringing in other top specialists such as endodontists, periodontists, oral surgeons and orthodontists as necessary to ensure that you have the best team possible to address your issue. Widely recognized as one of the best in solving difficult dental issues, patients frequently present to resolve issues with previous implant, crown, cosmetic or restorative procedures. If you have had trouble with a previous procedure, we will work with you to determine the nature and the duration of the problem, and then develop a plan to rectify it. the solution to the problem. We welcome the challenge of returning you to good health and helping you achieve the aesthetics you deserve. Because of our hard-earned reputation for exceptional quality and long-lasting results, we often help patients to solve issues that are not working. Whatever your situation, we will work with you to resolve your problem and exceed your expectations. Your health and smile are too important to place in the hands of just anyone; you deserve the experience, skill and unsurpassed results offered at Prosthetic Dentistry of Washington D.C. To experience the PDWDC difference for yourself, call 202-244-2101 today. Our state-of-the-art office in Washington D.C. serves patients from across the country, including Bethesda, Arlington, and nearby areas of Maryland and Virginia.